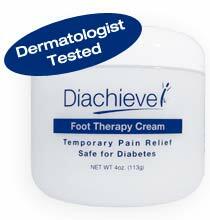 Diachieve™ Foot Therapy Cream has been created for the special skin care needs of people with diabetes>Dermatologist tested Diachieve™ Foot Therapy Cream is specially formulated for people experiencing foot pain, itch and dryness associated with diabetes. * Offers and prices may change without prior notice. The Diachieve™ brand is backed by a 100% satisfaction guarantee. You may return Diachieve products for any reason within 30 days of purchase for a full refund on the purchase price of the product (excludes shipping).